To make the brine, place the apple juice, lemon, bay leaves, rosemary, fennel seeds, garlic and salt in a large saucepan over high heat. Bring to the boil, stirring to dissolve the salt. Remove the lemon, herbs and garlic and set aside. pour the brining liquid into a large (10-litre-capacity) non-reactive container+. Add the cider, vinegar and water and stir to combine. Place the reserved lemon, herbs and garlic into the cavity of the turkey. Tie the legs with kitchen string and tuck the wings underneath. Place the turkey, breast-side down, in the brining liquid. Cover and refrigerate for 12 hours (but no longer). Remove the turkey from the container, discarding the brining liquid, and place on a lightly greased wire rack over a deep-sided baking dish. Preheat oven to 180°C (350°F). Pat the turkey dry and brush with the oil, sprinkle with pepper and pour the extra water into the dish. Cover with lightly greased aluminium foil and roast for 1 hour. Uncover and roast for a further 1 hour 30 minutes or until the skin is golden and the juices run clear when tested with a skewer. 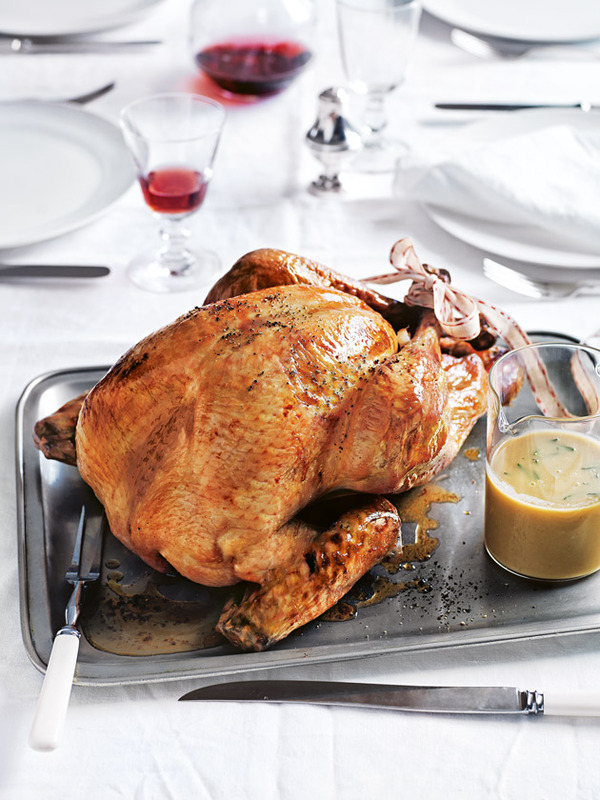 Reserving the pan juices, carefully place the turkey on a tray, cover with foil and allow to rest for 20 minutes. + Non-reactive materials include glass, plastic or stainless steel. This is a beautiful roast chicken recipe!